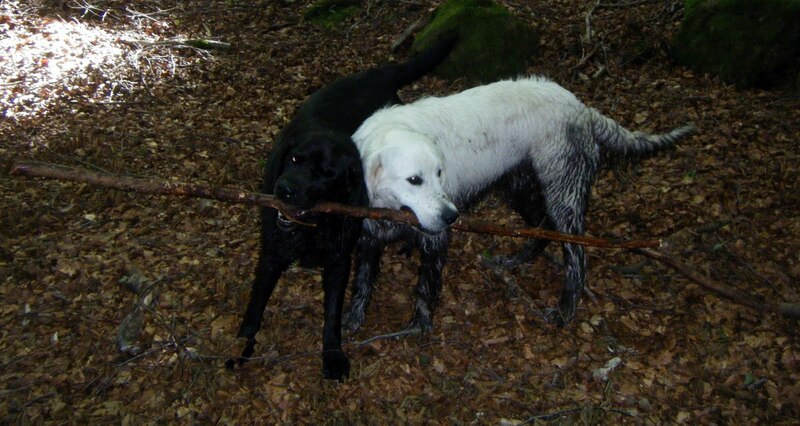 Herbie (the black lab in the photo) had his last walk with the gang today, as he is moving to Hove, near Brighton. Herbie has been the most wonderful addition to my pack – he leaps straight into the van, LOVES our walks together and gets on with ALL the other dogs. You NEVER need to worry about him wandering, or not getting on with anyone – he has the most beautiful gentle nature. He enjoyed a last stick fight with Ghillie (there have been many!!) and a last swim up at the Abbe this morning. I will miss him so much – I had to run away when when I was dropping him off home as tears were definitely just about there!! I will miss you terribly 🙁 but hope you and your family enjoy being back in Brighton.